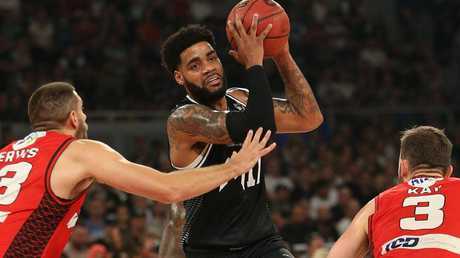 Melbourne United coach Dean Vickerman remains upbeat the reigning champions have the weapons to take a game in Perth. 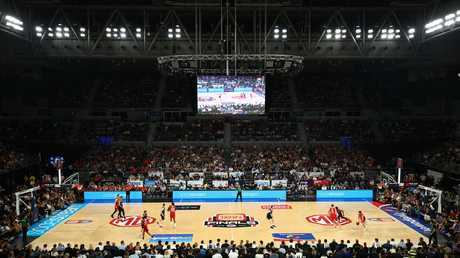 Unitedlevelled the best-of-five grand final series 1-1 with a pulsating 18-point win over Perth Wildcats at Melbourne Arena. DJ Kennedy and Mitch McCarron led the onslaught as United shut down dangerous Wildcats shooters and defended both the paint and the glass. The victory gives Melbourne, who went down by 10 points in Perth last Friday night, a golden opportunity to feed off the momentum and pinch game three. "We got to win one over there to win the championship, so we got to believe that we can do it," Vickerman said. "So many factors go into how we try and do it a little bit differently, I think we can make some adjustments in the way we set ourselves up for the week. "It's a little different in how you prepare for game one in how you prepare for game three. I don't think we need to practice as much, we just got to make sure our energy levels are at absolute peak." The third quarter, which brought about United's demise in Perth, was the catalyst for the home side. United outscored the Wildcats 17-6 in the third stanza to establish a game-winning break. United dominated the glass also, earning back repeat efforts with 20 offensive boards to 10. Kennedy starred less than 38 hours after being collected off the ball in Perth, with 12 points and 14 rebounds. "I believe out of the whole group he's right at the top of the guys that are so hungry to win this thing," Vickerman said. "From day one when he turned up he talked about it and he's continued to talk about it and he's quite emotional when he talks about coming here to win a championship." McCarron said "question marks" about Kennedy's reaction to the knock, which left him dazed for several minutes before half-time of game one, fuelled his desire. "He was probably frustrated with how game one went, especially as there was a few question marks, people throwing (at) him after his (knock)," McCarron said. "He looked great tonight and that's what we need of him, being aggressive, there's not many guys in the league right that can do it." Wildcats coach Trevor Gleeson lamented a lopsided rebound count and his side's heavy legs. "I don't think we had enough desire to get the ball, which is disappointing, you're in this finals environment and you're getting outworked." Here's GILBERT GARDINER'S take from Game 2. THE stage is set for Melbourne United. Go to Perth, get the win, come back, and win the championship. 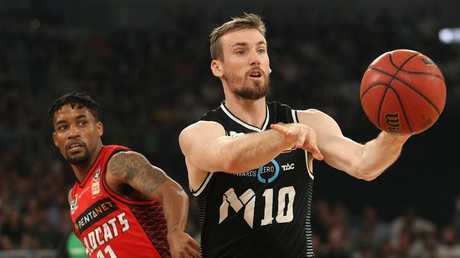 After levelling the best-of-five grand final series 1-1 at Melbourne Arena, putting Perth Wildcats to the sword in emphatic style, 92-74, the reigning NBL champions go into the crunch game three with a clean bill of health and a full head of steam. 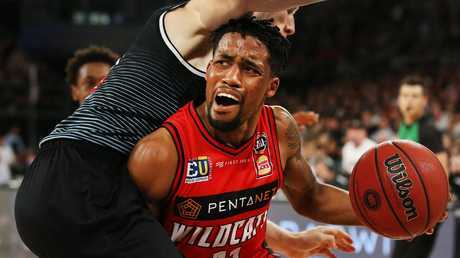 The visiting Wildcats threatened early, Bryce Cotton making the most of having the defensive shackles released on him every so slightly, but United weathered the early onslaught to lead by a solitary point at half-time. A great result for Melbourne, in front of a 10,062 crowd, given Casper Ware had only four points to his name - all from free throws - and no scorers in double figures. United surged early in the third quarter and never looked back, controlling the ball and speed of the game, to complete 18-point rout. Once bitten, twice shy. 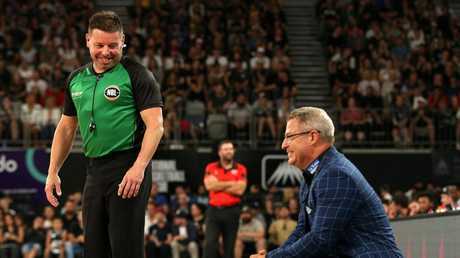 After being blasted out of game one with a third-quarter collapse United wasn't about to let history repeat when David Barlow was pinged with a third foul. Enter the V-Formation (our name). 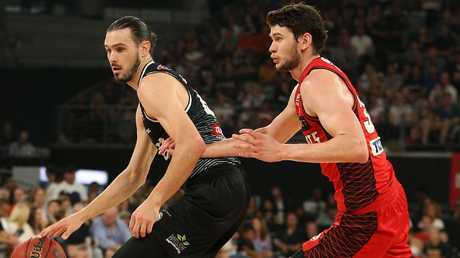 With game two on the line, and United leading by just two points (after Nick Kay free throws) with 8.26 mins to play in the third stanza, coach Dean Vickerman called for his three wood - Chris Goulding. The game's most prodigious shooter joined Casper Ware, Mitch McCarron, DJ Kennedy and Josh Boone on the hardwood, with a licence to thrill. United surged to score 12 of the next 14 points to build the matchwinning break. Kennedy set the tone with aggressive drives while Boone cashed in on McCarron's slick handles. When Goulding splashed a three, one minute and 24 seconds later, United had the damage to snare a healthy 12-point advantage. McCarron needs a new haircut, or something, to remind Perth how good he is. The Wildcats paid the price of giving McCarron far too much leeway at Melbourne Arena and ex-Cairns Taipan delivered, with 13 points and five rebounds. McCarron's ability to knock down a three is only bettered by the Queenslander's aggression in the paint and slick hands in close. He came to Melbourne for the sole reason of playing in the postseason. The opportunity to work under Dean Vickerman and alongside Casper Ware were the cherries on top for the x-factor McCarron. By the end of the series, should United be successful, McCarron might well be considered the NBL's recruit of the year. 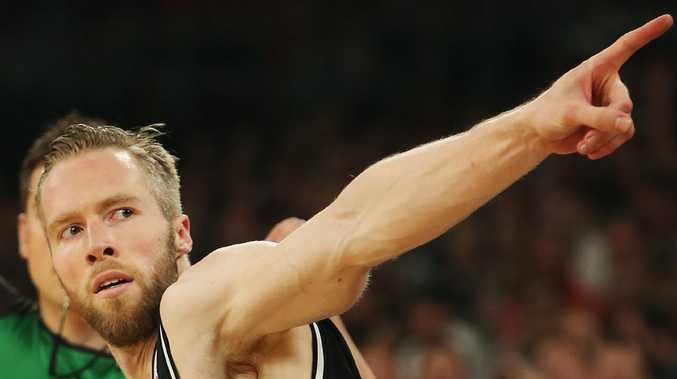 Andrew Bogut, who returned to NBA champions Golden State Warriors, was all the rage when the Sydney Kings swooped but unlike Bogut, McCarron is alive in the NBL championship race. Doubt surrounded DJ Kennedy's fitness after the athletic swingman went down in game one and never really had the same impact after a hard knock to the jaw. That was allayed quick sticks at Melbourne Arena as the Pittsburgh native sparked United with 12 points and 14 rebounds. Kennedy is to Melbourne what a barometer is to atmospheric pressure. He reads the play and then makes it with aggression, at both ends of the floor. As Ware wrestled with his shot, going at 0-from-8 to half-time, Kennedy made things happen of the dribble. His complete game included four assists and two steals.